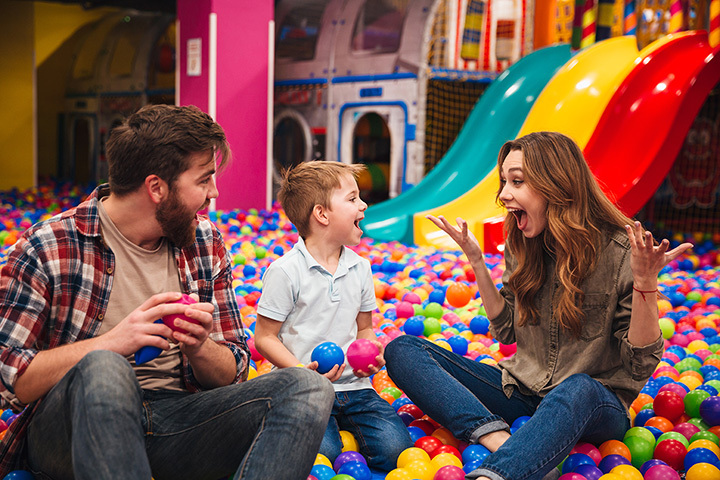 From birthday parties to fun family days out, the kids' play centers in Arizona offer fun for children all of ages...and parents, too! Take them out for a fun-filled morning, afternoon, or all-day adventure. They'll have a great day out at one of these 10 kids' play centers—and you'll have a peaceful car ride home as they sleep soundly. You can thank us later! Makutu's Island was designed with a tropical theme to make beating the Arizona heat all that much more fun. Take in the towering trees, climb around, explore mysterious caves, try out the zip line, and so much more. Visit today and take a trip into fantasy and adventure—no matter what age you are. For one low price at Party Jungle, kids can play and be entertained all day long. There are carnival-style rides, a jungle gym, mini golf, laser tag, and five rooms for private parties. Whether you bring the kids for an afternoon, a full day, or a birthday, party, they'll feel special all day and want to come back again and again. Per its website, Whipples Fun Center specializes in fun "for the whole family." Featured attractions include laser tag, bumper cars, trampolines, and an arcade, to name a few. And for parents who want some free time of their own, Whipples café serves beer, wine, and custom pizzas, sub sandwiches, and a variety of tasty snacks—so they can enjoy themselves, too. Freedom Station provides fun for the whole family—kids and all. For only $25, you can get 25 game credits and choose from any four of the station's attractions. These include: The arcade, climbing wall, outdoor laser tag, Wild West mini golf, and Freedom Freddy's playhouse. Kids can enjoy the playhouse which has tunnels, swinging bars, and slides, and is only $5 for kids 12 and under to play all day. Kids can let their imaginations run wild at the Play Grounds FunZone, which spans 3,500 square-feet. Kids ages eight and under can climb, crawl, and slide on an assortment of animal characters, and toddlers can enjoy their own special area as well. While kids are playing, parents can enjoy locally-sourced coffee and gourmet food at the café. For information on classes, memberships, and fun deals, head to the Play Grounds website. If bouncy castles are your child's favorite attraction, they'll go bonkers at Bounce U, where they can bounce all over! There are slides, bounce castles, games, and more. Host a birthday party here, or just bring your child for Parents' Night Out or an Open Bounce. Details for these events can be found on the Bounce U website's calendar. For tiny tots ages five and under, there's Jubeelieve in Avondale. It's close to major cities like Phoenix, Glendale, and others, and offers 2,000 square-feet of climate-controlled play space for little ones to run, slide, and jump seven days a week. Would Jubeelieve it?! Well, you should! Kids who love obstacle courses, sports games, slides, bounce houses, and other fun activities will love spending an afternoon at Jumpers Jungle. Kids of all ages are sure to have a great time at the many activities here—and when they work up an appetite, they can enjoy a snack at one of the snack areas and then get right back to playing. By the end of the day, they'll be so worn out, they might just fall asleep in the car! Really, what else could you ask for? Uptown Jungle has attractions for all of the kids—no matter their age. For example, there are trampolines, climbing walls, a ninja course, a ball blaster area, a mini zip line, and a spider tower. And that's not all! Check the attractions out today. We know you'll love the jungle. Luv 2 Play offers an 8,600-square-foot indoor playground, a pretend area, a toddler area, a baby area, games, and places to eat, relax, and host parties. Family fun packs and monthly memberships are offered—because Luv 2 Play knows you and your family will want to come back again and again. Stop by to see the space for yourself today.